Joel Paterson and Jim Liban. This week at Jazz in the Park, two musical veterans collaborate. The Milwaukee vocal and harmonica legend for nearly 50 years, Jim Liban, and the Chicago guitarist, Joel Paterson, are teaming up once again as the Jim Liban & The Joel Paterson Trio. Besides Liban and Paterson, the band also includes Beau Sample on bass and Alex Hall on drums. They perform together on Thursday, 6 p.m. in Cathedral Square Park. Paterson responded to our questions via email. I started learning blues guitar by ear from records as a teenager. I joined Jim Liban’s band 20 years ago and learned a lot about the blues and performing from him. I met Liban because he was looking for a new guitar player in the mid 1990s. I was in my hometown of Madison and he heard about me through the blues grapevine and hired me. I moved to Chicago in the late 1990s and lost touch with Jim for a while. 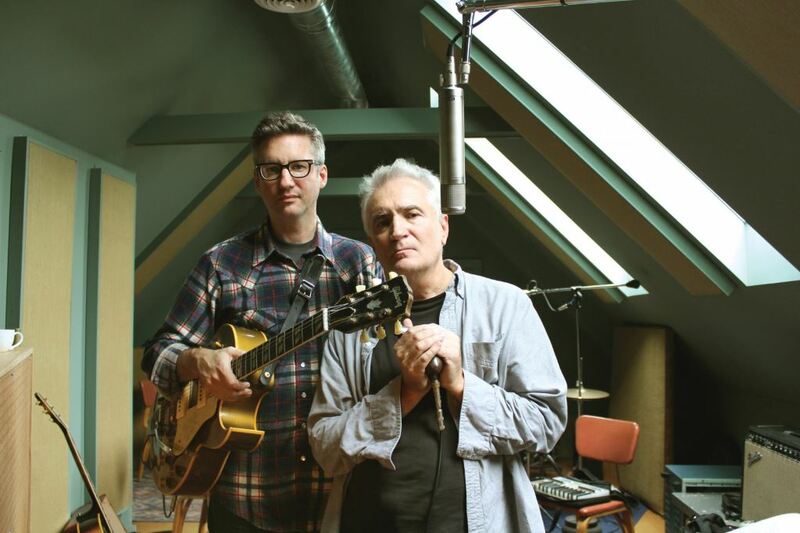 The album, I Say What I Mean (recorded in Chicago) has been a great reunion for us, and a chance for me to perform again with one of my musical heroes. Liban was approached to play it this year. It’s such a great event, and it seems like the whole town is there! Way too many blues and jazz guitarists to list, but here’s a few: B.B. King, Freddie King, Albert Collins, Robert Johnson, Charlie Christian, Tiny Grimes, Les Paul, Barney Kessel, Grant Green. I play a mix of blues, swing, jazz, and western swing in Chicago as a working musician. With Liban we will be playing more straight blues, but many of them are Liban originals – so it’s our own take on traditional Chicago blues. I just trying to play good music with taste and dynamics; if the crowd is with us, that’s a great feeling. I think B.B. King was the ultimate in taste, tone, and showmanship. Music is my job, I try to keep things as simple as possible and concentrate on playing good music. I learned mostly by ear. I’ve always been a record junkie, so that’s my primary education. By playing around the Madison blues scene in the late ‘80s and early ‘90s. I played on State Street a lot back then, that was a good way to get my start. Too many to list. Playing last year on the big stage with Jim Liban at Milwaukee Summerfest was a thrill! Where are you performing next/ where can people see you? I play every Sunday night at The Green Mill in Chicago with an organ trio. The Mill is a classic old jazz club. What is your favorite song that you perform and why? Come to Jazz In The Park and find out! In Chicago, The Green Mill, The Hideout, Honky Tonk BBQ. Harmony Bar in Madison. I’m a little out of touch with Milwaukee these days. I reunited with Jim Liban a couple of years ago at a gig at The Tonic Tavern, that’s a fun place! The people are always into the music, and not afraid to dance, and I know they love the blues. So I love coming here to play!